We are a fully equipped Pilates and Yoga studio on the Island of Boca Grande, FL open to the island community with goals to improve their well-being. 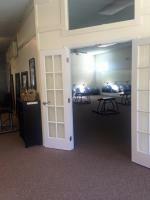 Our studio is a serene 2800sf space located in the downtown historic district, just a 1 minute walk to the Gulf beaches. 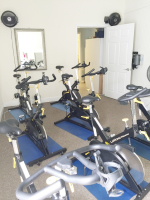 We've been on the island for over 12 years, in this location more than 5 seasons, please make us your special island fitness studio where you'll find a variety of other classes that suit your needs. 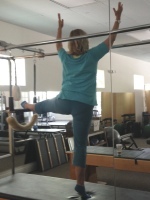 Our sun-lit sanctuary offers professional private and group instruction in Pilates, Yoga, and Personal Training. Enjoy Signature Classes like: Barre', Circuit, Nia, FitBall, Mixed-level, Restorative & Vinyasa Yoga, Power plate, a dedicated Indoor 8 Cycle/spin room and private sessions. Our teacher's are certified in Classical Romana & Peak, Balanced Body, BASI, Stott and pre/post-rehab Physical Therapy integration. We are very comfortable with the activie older body and athletically inclined younger crowd. When you come to Banyan you can mix it up and enjoy all of the above for a wonderful cross-training workout, our instructors know and love their work. If you have never tried a Pilates workout then this is the best place to start! You will leave feeling taller, stronger, more flexible and just an overall feeling of wellness. Posture analysis is built into all your trainings at Banyan Tree. Our teachers are experienced to assess imbalances in the musculatures that support our spine and we understand how much posture can affect someone's life. Poor postural habits have a direct impact on everything from chronic pain to organ function to mood and depression. Form-Function-Stability-Movement, it's within these words and the 6 Pilates Principles that you will feel better, move better and acheive your goals whether you want to tone, strengthen, gain flexibility or manage a weight concern, we can want to help you succeed.